Arrhythmias are discovered in about 1% of fetuses. Of these arrhythmias, 10% are considered potential sources of morbidity. Most disturbances of fetal cardiac rhythm are isolated extrasystoles that are of little clinical importance. Sustained arrhythmias may be associated with heart failure, however, manifesting as nonimmune hydrops fetalis. One of the most remarkable examples of successful fetal therapy resulting in intact fetal survival is the conversion of sustained tachycardia in the hydropic fetus. The treatment of fetal cardiac arrhythmias requires a clear understanding of the mechanism of the arrhythmia, a search for structural cardiac and extracardiac anomalies, and an understanding of the pharmacology and pharmacokinetics of potent antiarrhythmic agents in the mother and fetus. The sinoatrial (SA) node has characteristics that allow depolarization to occur faster than it does in other myocardial cells, initiating the contraction sequence. When the SA node depolarizes, the atrial myocardium contracts in a synchronous fashion with the lateral walls moving toward the interatrial septum, forcing blood into the ventricular chambers. The electrical impulse generated at the SA node is conducted through the atrial myocardium to the atrioventricular (AV) node. From the AV node, the signal is propagated to the right and left ventricular chambers through the Purkinje fibers and causes ventricular mechanical systole. During diastole, the atrial and ventricular chambers relax, allowing filling to occur. This relaxation phase of the heart is also very important in the human fetus because it is during this portion of the repolarization of the heart that abnormalities in electrical conduction can produce serious arrhythmias. The fetal heart functions in many ways similar to the adult heart. It is important to understand some of the distinguishing features, however. The fetal heart rate is significantly higher (120–160 beats/min) than the adult heart rate (50–70 beats/min). The fetal myocardium is less compliant than the infant or adult heart. In addition, sometimes there are aberrant pathways connecting the atrial and ventricular chambers, providing an accessory route for AV depolarization. In the newborn or adult patient, a 12-lead electrocardiogram (ECG) is used to establish the type of arrhythmia. The prenatal diagnosis cannot rely on an ECG through the maternal abdominal wall because the fetal P waves are rarely seen, and the fetal QRS complex is dwarfed by the signals from the maternal abdominal ECG, and insulating properties of the vernix caseosa. Investigators rely primarily on ultrasound. Fetal studies usually begin with an examination of fetal and cardiac anatomy by the use of two-dimensional ultrasound. The fetus is also examined for collections of fluid in the pericardial sac, the pleural spaces, the abdomen, and the skin. The amount of amniotic fluid is recorded. Cardiac size and wall thickness are evaluated. M-mode ultrasound traditionally has been used to establish the type of arrhythmia. The M-mode cursor is positioned so that it crosses one structure that moves with atrial contraction (atrium, AV valves) and one structure that moves with ventricular contraction (ventricle, semilunar valves). In this manner, the relative timing of events can be established. We rely primarily on pulsed Doppler ultrasound for rhythm assessment and detection of flow disturbances (regurgitation, stenosis). The rhythm assessment begins with measurement of the heart rate and its variability. The atrial rate and ventricular rate should be assessed independently because they may not have a one-to-one association. Fig. 1. Doppler interrogation sites for rhythm interpretation: A. Left ventricular inflow–outflow tract. B. Hepatic vein near the junction of the inferior vena cava (IVC). C. Superior vena cava (SVC). LV, left ventricle; LA, left atrium; Ao, aorta; RA, right atrium; IV, innominate (brachiocephalic) vein. 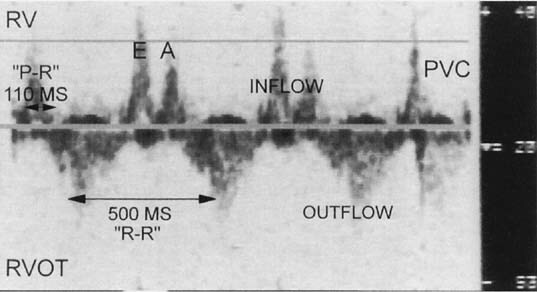 If the sample volume size is increased and the transducer is positioned in the inflow–outflow region of the ventricle, the noninvasive P–R interval can be determined during sinus rhythm (Fig. 2). This measurement tends to overestimate P–R interval, and recently Bergman6 suggested that using the mitral valve closure may be more closely predictive of actual P–R interval. It should be noted that the measurement represents activation mechanically, so that any disease slowing electromechanical activation of either the atrium or the ventricle, may lengthen this interval, and it is not specific for AV nodal disease. In addition, the inflow–outflow view may not be as predictive of the P–R interval during tachycardia, however, because of changes in diastolic timing. Fig. 2. Noninvasive P–R interval by Doppler (recorded during sinus rhythm from the right ventricular inflow–outflow view). Tricuspid inflow E and A waves are marked. Right ventricular outflow tract (RVOT) velocities are shown below the baseline. A premature ventricular contraction (PVC) results in early outflow velocity and interrupts inflow. Are atrial and ventricular contraction rates normal or abnormal? If the contraction rates are abnormal, is there a regular or stable pattern of contraction in the atrium and ventricle? If the pattern of contraction is irregular, is the irregularity repetitious or irregularly irregular? What is the association between the atrial and ventricular contractions? Answering these questions defines the rhythm, and electrophysiologic texts can be used to specify further the diagnosis or differential diagnosis (Table 1).10, 11 A full description of the arrhythmia usually cannot occur, however, until the postnatal period. In a select few institutions worldwide, fetal magnetocardigraphy may be available for prenatal rhythm assessment. Magnetocardiography is similar to ECG since the electromagnetic currents of the heart display patterns that are virtually superimposable. At our institution, a transesophageal electrophysiologic procedure is often performed in infants with sustained fetal tachyarrhythmias. For bradyarrhythmias and fetal ectopy, an ECG and 24-hour ambulatory recording are usually sufficient to define the rhythm. AV, atrioventricular; VA, ventriculoatrial; SVT, supraventricular tachycardia. Isolated extrasystoles are the most commonly noted fetal arrhythmia. They often are detected during routine auscultation at a prenatal visit. These arrhythmias almost always are supraventricular in origin and constitute about 85% of the fetal arrhythmias encountered (Table 2). Occasionally, these extrasystoles are junctional or ventricular in origin. Isolated ectopy seems to be a self-limited process, resolving completely before or immediately after delivery. Of fetuses with premature atrial contractions, however, 1% have concomitant structural heart disease.16 Of such patients, 0.5–1% develop a re-entrant tachycardia later in gestation (Fig. 3). All such fetuses should undergo a targeted ultrasound, including an echocardiographic evaluation, to rule out structural anomalies, and weekly auscultations should be done throughout pregnancy to rule out a sustained tachyarrhythmia. Fig. 3. Fetal tachycardia initiation. A premature atrial contraction (PAC) initiating supraventricular tachycardia in M-mode. 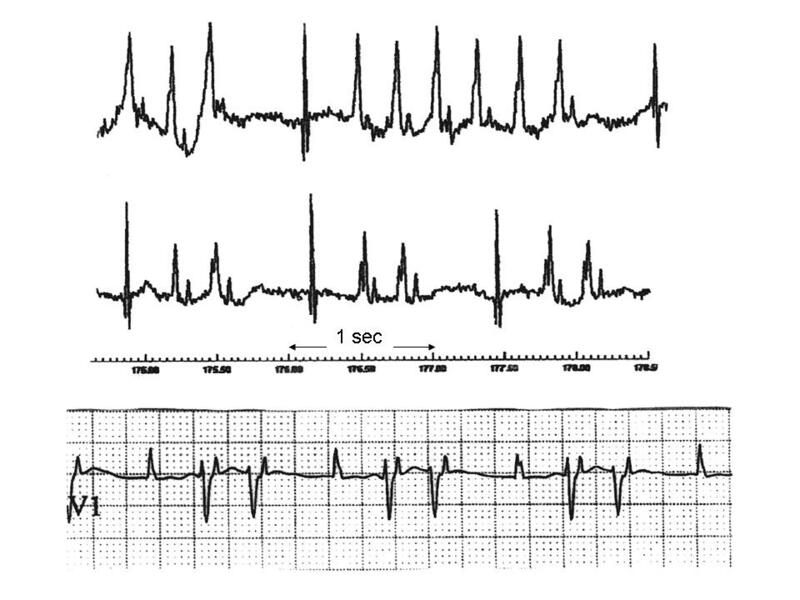 An earlier PAC (arrows) did not initiate supraventricular tachycardia. Note 1:1 concordance. RV, right ventricle; LV, left ventricle. SVT is the most common serious arrhythmia detected prenatally. It accounts for about 6% of referrals, as shown in Table 2. The rate of SVT is characteristically between 240 and 260 beats/min, with 1:1 AV concordance (see Figs. 2 and 3). Most tachyarrhythmias noted in the fetus are supraventricular in origin and can result from one of three mechanisms. Supraventricular tachyarrhythmias can be re-entrant (reciprocating, related to a circular, or “circus,” movement of electrical activity), automatic (arising in an irritable ectopic focus above the bundle of His), or a manifestation of atrial flutter or fibrillation. *Two fetuses had structural heart disease, and two had pericardial effusions. One patient developed supraventricular tachycardia 3 weeks postnatally. †Two fetuses had an atrioventricular canal defect. AV, atrioventricular; SVT, supraventricular tachycardia. The most common mechanism of SVT in the fetus and neonate involves an electrical impulse that re-enters the atrium from the ventricle, resulting in a circular movement of repeated electrical stimulation that is faster than, and independent of, the normal sinus nodal pacemaker. Such a circus movement can occur within the AV node because of dissociation of the conduction tissue, resulting in a fast and slow limb, as in the adult. 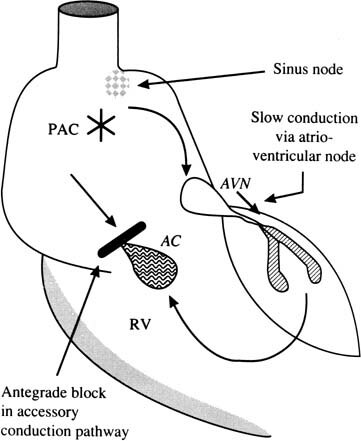 In the fetus, re-entrant SVT is almost always due to a discrete accessory conduction pathway outside of the AV node, however, that directly connects the atrial and ventricular myocardium (Kent’s bundle in Wolff–Parkinson–White syndrome) and serves as the fast limb that bypasses the delayed conduction of the AV nodal tissue. To establish AV re-entrant tachycardia, a premature atrial contraction occurs at a pivotal time during the cardiac cycle when the accessory connection is still refractory in the antegrade direction (Fig. 4). The impulse encounters the AV node after its shorter refractory period. The impulse conducts slowly through the AV node and the ventricular muscle, then encounters the accessory conduction pathway in the retrograde direction, after a significant time delay. 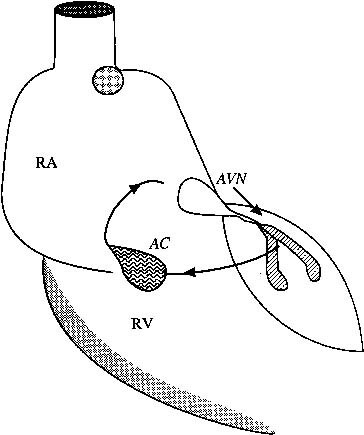 After retrograde re-entry of the electrical impulse into the atrial muscle through the accessory pathway, a circular (circus) movement of electrical activity that incorporates the AV node in the antegrade direction is established (Fig. 5). The wave of depolarization stimulates atrial and ventricular contraction at a rate regulated by the properties of the electrical circuit—the conduction rate and the refractory period. The heart beats at the rate of the fastest pacemaker; this electrical stimulus drives the heart at a tachycardiac rate that is independent of the SA node. Antiarrhythmic agents that depress conduction and prolong refractory periods in the AV nodal or accessory conduction tissue can disturb the re-entrant circuit and may be useful for the termination and prevention of re-entrant tachycardia. These agents include the cardiac glycosides (digoxin), β-blockers (propranolol), type Ia antiarrhythmics (quinidine), type Ic antiarrhythmics (flecainide), and type III antiarrhythmics (amiodarone, sotalol). Ectopic or automatic tachycardias occur when there is spontaneous depolarization of a pacemaker focus within the atrium. In contrast to the sudden-onset, sudden-cessation pattern of re-entrant tachycardias, these tachycardias are usually incessant, with varying degrees of AV block. Fig. 6. 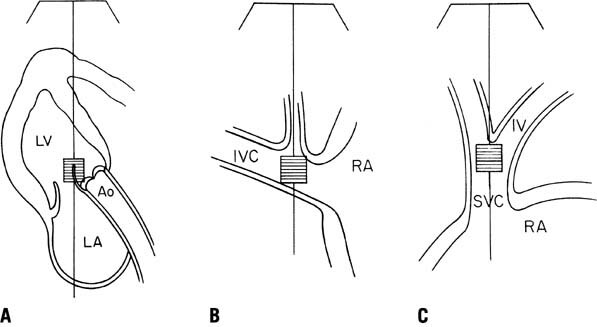 Reversal of flow in the inferior vena cava (IVC) by Doppler. RA, right atrium. Atrial flutter and fibrillation are infrequent causes of SVT in the fetus. Atrial flutter seems to result from a circus movement of electrical activity within the body of the atrium. The atrial rate postnatally is typically 300 beats/min. In the fetus, rates of 400–460 beats/min are the rule, with varying degrees of AV block (Fig. 7). Atrial flutter has been associated with a poor prognosis, which may be due to its association with structural heart disease in 20% of cases and the development of hydrops fetalis. In contrast to postnatal therapy of atrial flutter, in which increasing the degree of AV block with a resultant decrease in the ventricular rate may lead to a decrease in heart failure, control of the ventricular response rate in fetuses with severe hydrops secondary to atrial flutter has not resulted in an improvement in the fetal hemodynamic status. Kleinman and Copel19 suggested that this lack of improvement is probably due to the unique cardiovascular dynamics of the fetus – its relatively restrictive ventricular myocardium and its relatively volume-loaded right heart. They concluded that much of the decompensation accompanying tachyarrhythmias reflects diastolic rather than systolic dysfunction. Specifically, unless the atrial flutter is controlled with resumption of a 1:1 AV contraction sequence, there will continue to be atrial contractions against a closed or partially closed AV valve, resulting in atrial pressure waves that keep mean systolic venous pressure high, retarding the resolution of fetal edema and effusions. This condition may require an agent such as sotolol after control of the ventricular response rate with digoxin. Atrial fibrillation seems to be even rarer than flutter; however, the same principles apply to therapy. Fig. 7. 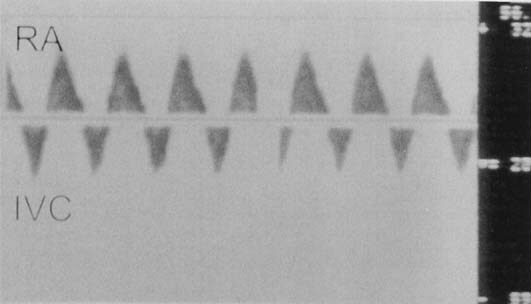 Atrial flutter with a 2:1 block by M-mode. AV, atrioventricular; RV, right ventricle; LA, left atrium. Ventricular tachycardia (Fig. 8) is highly variable with regard to rate. Rates vary from 400 beats/min to 170 beats/min. The diagnosis is made with M-mode or Doppler echocardiography, which shows AV dissociation with the ventricular chamber contracting at a faster pace than the atrial chamber. Not all of these fetuses require antiarrhythmic therapy. Misdiagnosing ventricular tachycardia as SVT, which leads to the administration of digoxin, may cause life-threatening ventricular fibrillation. It is imperative to understand the mechanism of the tachyarrhythmia so that a rational management strategy can be formulated. We consider therapy if the heart rate is sustained at greater than 200 beats/min or if there is associated hydrops fetalis. Fig. 8. The top two tracings of fMCG show non-sustained ventricular tachycardia and ventricular couplets due to myocarditis in a 29 week fetus. After delivery, only couplets were noted (bottom tracing). Bradyarrhythmias may be the result of blocked premature contractions, sinus bradycardia, or AV block. About 5% of all fetal arrhythmias are classified as slow. The most common cause of fetal bradyarrhythmias with ventricular rates less than 60 beats/min is complete heart block. These fetuses can be divided into two groups: fetuses with complex congenital heart disease and fetuses with immune complex-related damage to the fetal conduction tissue secondary to maternal autoantibodies. Some have proposed that the mechanical P–R interval can be used to evaluate for P–R prolongation in SSA-positive mothers, however, it is unclear that this would effectively screen those at risk, since repolarization abnormalities (prolongation of QT) can not be detected with this method, and the onset of AV block appears to be very rapid. This technique has shown that fetuses with PR prolongation can have other pathologies, however, including incomplete AV block, atrial flutter and long QT syndrome.28 The mechanical PR interval overestimates the actual P–R interval. Effective prenatal treatment for complete heart block has not been established. Maternal administration of β-agonists such as terbutaline has not been associated with improved hemodynamic status (resolution of hydrops), despite increasing the heart rate.29 This situation is probably similar to atrial flutter/fibrillation in that cannon A waves associated with atrial contractions against a closed AV valve need to be reduced to decrease the systemic venous pressure that should result in resolution of the hydrops. Recently, some authors have associated the use of β-sympathomimetics with better outcomes.30, 31 Attempts to reduce the circulating maternal antibodies have included the use of plasmapheresis32 and the administration of prednisone.33, 34 Prednisone is a poor choice for fetal immunosuppression because it is largely inactivated by the placenta.35 Maternal dexamethasone or betamethasone therapy may hold more promise.36, 30 Two attempts at fetal pacemaker placement have been reported.37, 38 Neither attempt resulted in fetal survival. In general, the prognosis for congenital heart block is good when the ventricular rate is greater than 55 beats/min in the structurally normal fetus. When complete heart block is identified in a fetus, close echocardiographic follow-up is necessary to look for the development of hydrops fetalis. The presence of hydrops fetalis is a poor prognostic sign, and when it is associated with structural heart disease, it almost always is fatal. Our experience with fetal MCG in the evaluation of 29 fetuses with congenital heart block39 has documented junctional or ventricular tachycardia in 30% of fetuses, both in the structural and isoimmune groups. This may explain the high mortality seen prenatally. In addition, repolarization abnormalities (QT prolongation, T wave alternans)40 and myocardial hypertrophy 41 may also increase risk of sudden fetal demise. At our institution, the perinatologist and pediatric cardiologist in consultation formulate a treatment plan. When SVT is diagnosed in the fetus, a detailed ultrasound is performed to determine fetal growth; to exclude any associated structural anomalies; and to look for the presence of pericardial, pleural, or ascitic fluid. The pediatric cardiologist determines the atrial and ventricular rates of contraction, atrial and ventricular size and function, and presence and magnitude of AV valve regurgitation. Immediate pharmacologic therapy is undertaken if there is evidence of hydrops fetalis or hemodynamic compromise. Otherwise, the patient is admitted for continuous electronic fetal heart rate monitoring to ascertain the proportion of time spent in tachycardia. Our practice has been to manage patients expectantly if the arrhythmia is not sustained (<50%) and there is no evidence of fetal hemodynamic compromise. Increasingly, fetal magnetocardiography (fMCG) is being used to determine mechanism-specific treatment (or non-treatment). In some circumstances, when the characteristics of the tachycardia suggest that it may be ventricular or junctional, when tachycardia is seen in combination with bradycardia, or when it is intermittent and does not require immediate therapy, fMCG can be obtained prior to initiation of therapies. Although spontaneous resolution of sustained fetal SVT has been reported,35 about 60% of such fetuses show hemodynamic compromise. Van Engelen and associates44 noted hydrops fetalis in 22 of 48 fetuses that presented with SVT. The development of hydrops fetalis can be rapid, with progression in 24–48 hours. In addition, when there is hydrops fetalis, conversion of the tachyarrhythmia with medical therapy is more difficult. For all of the aforementioned reasons, we institute pharmacologic therapy in almost all cases of sustained fetal SVT remote from term. If the fetus is at term, we recommend delivery with postnatal management. Our experience suggests that direct fetal intramuscular injection of digoxin combined with transplacental therapy seems to shorten the time to cardioversion and sustained sinus rhythm.47 Because delays in cardioversion can lead to intrauterine or neonatal death, we start with the intravenous route for maternal digoxin loading over the first 24 hours (1–1.5 mg), followed by large oral maintenance doses (0.5–0.75 mg/day) to maintain maternal serum digoxin levels in the high therapeutic range (1.5–2 ng/mL). If there is no sinus rhythm after maternal levels are therapeutic, the fetus can be loaded with digoxin at a dose of 88 mg/kg (estimated nonhydropic fetal weight for gestational age)48, 49, 50 into the fetal buttock under direct ultrasound guidance. Repeat injections can be performed at 12-hour intervals (not to exceed three injections) to maintain sinus rhythm more than 50% of the time. Cordocentesis enables direct access to the fetal circulation and may allow a quicker response to therapy. The fetal intramuscular route provides a more sustained release of the medication and poses less risk to the fetus than cordocentesis. Thirteen cases of SVT complicated by hydrops were treated with intravenous therapy by way of the umbilical vein by Hansmann and colleagues51 when transplacental therapy failed. There were five deaths, and a mean of 7 injections (range 2 to 25) was required to achieve a sustained sinus rhythm. The first intramuscular injection of digoxin is not always sufficient to sustain a normal sinus rhythm; fetuses may require a second or third injection. Presumably, on the basis of predicted pharmacokinetics, the supraventricular tachycardia recurs when the fetal digoxin level becomes subtherapeutic. The decrease in hydrops associated with conversion of the arrhythmia may lead to higher (therapeutic) fetal drug concentrations secondary to increased placental transfer or a decrease in the fetal volume of distribution of maternally administered drugs. If maternal intravenous and direct fetal intramuscular therapy with digoxin fails to sustain a normal sinus rhythm in the hydropic fetus, a second transplacental antiarrhythmic drug should be instituted. The choice of second-line agents for the treatment of fetal SVT depends to a large extent on the experience and regional preference of the cardiology community; a strict “cookbook” approach is naive. The most important aspect in choosing antiarrhythmic agents is a clear understanding of the mechanism of the tachycardia and knowledge of the mode of action and possible toxicities of the agents for both mother and fetus. All antiarrhythmic agents are proarrhythmic to some degree. Even digoxin, the drug of choice in the initial treatment of in utero SVT, can lead to a fatal arrhythmia. Digoxin may shorten the effective refractory period within the accessory conduction pathway in Wolff-Parkinson-White syndrome, allowing potentially rapid conduction in the fetus if cardiac rhythm deteriorates into atrial fibrillation. Digoxin may cause a rapid conduction of the fibrillatory waves, leading to ventricular tachycardia. Presently, it is not possible to diagnose Wolff-Parkinson-White (WPW) syndrome in utero with conventional methods.14 Although the risks of antiarrhythmic therapy seem small given the infrequency of atrial fibrillation in the fetus, it is imperative to receive informed consent from the parents of these fetuses before administering such agents. WPW may be suspected if the echocardiographic mechanical P–R interval is quite short (less than 70 ms). In those centers where fMCG is available, this method can confirm the presence of WPW. To date, we have not altered therapy, even when fMCG has shown WPW, because the evidence base for its danger is not clear in the fetal period. Propranolol or esmolol may be effective in slowing the rapid ventricular rate associated with atrial tachycardia. β-Blockers are commonly prescribed in pregnancy to treat hypertension and generally are well tolerated and considered relatively safe. There are reports of intrauterine growth restriction with their use, however, which may be due primarily to the underlying pathophysiology of the disease. Although the favorable maternal profile makes β-blockers an attractive second-line agent, their efficacy in treating fetal SVT in the setting of hydrops is modest at best. This class of drugs generally is contraindicated in patients with asthma and diabetes. Quinidine is a type I antiarrhythmic that blocks the sodium current responsible for the rapid phase 0 of the action potential and is a reasonable choice as a second-line agent. It also decreases conduction velocity and prolongs the refractory period in atrial, ventricular, His–-Purkinje, and accessory conduction tissue. Quinidine is effective for re-entrant tachycardias that use these pathways. Quinidine also is one of the drugs of choice for control of rapid ventricular response to atrial fibrillation/flutter. For flutter or fibrillation, digoxin should be administered before quinidine to prevent the rapid ventricular response that may occur if quinidine’s vagolytic action enhances AV nodal conduction at the outset of therapy. Quinidine may prolong P–R, QRS, and PT intervals and may precipitate ventricular tachycardia associated with excessive Q–T interval prolongation. This effect seems to be idiosyncratic rather than dose related. This proarrhythmic potential affects about 2–5% of adult patients taking this medication. Quinidine also can result in noncardiac side effects in a substantial percentage of users, including gastrointestinal upset (up to 50%), and less commonly fever, skin rash, cinchonism, autoimmune thrombocytopenia, and hemolytic anemia. In addition, quinidine can lead to a twofold or greater increase in the serum digoxin level. We empirically decrease the digoxin dose by 50% before quinidine administration. A few investigators have used oral procainamide, a type I antiarrhythmic agent, as second-line therapy, although reports of its use are largely anecdotal.46 It is probably no more effective than quinidine, and intravenous administration, at least, has been associated with onset of uterine contractions. Our experience with verapamil has been disappointing. Verapamil has been associated with profound cardiac depression and cardiac arrest after intravenous administration in the fetus and neonate and has fallen out of favor. In older series, it had been used effectively in the absence of hydrops, when frequent breaks in tachycardia were noted. Presently, we rarely treat such cases. We have had good success with amiodarone in patients who fail digoxin therapy in the setting of hydrops fetalis. Amiodarone is a class III antiarrhythmic agent that profoundly affects action potential duration and refractoriness within the atrium, AV node, accessory pathways, and ventricle. It also is useful for the treatment of ventricular tachycardia and a variety of SVTs. We have treated several patients with SVT complicated by hydrops fetalis with amiodarone when they were unresponsive to multiple agents, including digoxin, procainamide, verapamil, and quinidine. All cases resulted in cardioversion with no untoward effects. We reported our experience with amiodarone in 25 fetuses with incessant tachycardia and either hydrops fetalis (n = 23) or ventricular dysfunction (n = 2) who failed digoxin monotherapy and secondary antiarrhythmic agents.56 Amiodarone caused progressive slowing of the tachycardia rate over time and promoted more sustained periods in sinus rhythm. Fewer than 50% of fetuses with atrial flutter showed a sustained cardioversion, however. In the remaining cases, the heart rate control alone allowed maintenance of the pregnancy. These findings strongly support the use of amiodarone as the transplacental antiarrhythmic drug of choice for the hydropic fetus with digoxin-refractory tachycardia with 1:1 concordance. Sotolol may be more successful in sustained conversion of atrial flutter. Sotolol is the most recent addition to in utero antiarrhythmic agents and is reported to be effective in 80% of fetuses with atrial flutter and 60% with SVT.58 Sotolol is a nonselective β-blocker that also prolongs the Q–T interval. It is used widely outside the United States for the treatment of supraventricular and ventricular arrhythmias. Two of our patients with AV reciprocating SVT failed sotalol therapy at 400 mg/day and responded to amiodarone. Sotolol has shown a 25–30% mortality rate for 1:1 reciprocating tachycardia when administered to hydropic fetuses. It seems to be an excellent choice for digoxin-refractory atrial flutter. Major adverse effects are related to β-blockade and prolongation of the Q–T interval. The occurrence of torsades de pointes is dose related, in contrast to quinidine. Electronic fetal heart rate monitoring is the mainstay in modern obstetrics for obtaining reassurance of normal acid–base status of the fetus during labor. It relies on interpretation of fetal heart rate, variability, and periodic changes. Such reassurance is not possible in fetuses with sustained arrhythmias. Biophysical profiles are of limited benefit in the intrapartum period, and serial fetal scalp blood sampling is not a very palatable option. Therefore, these pregnancies are usually delivered by cesarean section because of the inability to assess fetal well being. Pulse oximetry has proved to be a most useful tool for assessing oxygenation in both adults and children. New technology has been developed for intrapartum fetal pulse oximetry. The devise consists of a sensor that is placed transvaginally alongside the fetal face. Currently, there is no evidence in the literature that fetal pulse oximetry (FPO) as an adjunct to electronic fetal heart rate monitoring improves neonatal outcome.59, 60, 61, 62 However, in pregnancies complicated by sustained fetal arrhythmias, this may be one of the few instances where this technology may be useful for reassurance of normal acid–base status of the fetus during labor. Fetal magnetocardiography (fMCG) is a promising technique presently available in a few institutions including the University of Wisconsin BioMagnetism Laboratory with whom we collaborate. FMCG provides precise electrophysiologic measurements of the cardigram (P, QRS, T waves) and the ability to observe heart rate trends over 1 hour similar to a Holter trend.67 It also provides simultaneous recording of electromechanical events using echo/Doppler and fMCG,68 and the ability to link fetal heart rate trends to fetal activity69 (called actocardiography) at gestations much earlier than possible using conventional cardiography. Adequate recordings are possible after about 17–20 weeks' gestation using present SQUID (superconducting quantum interference device) technology. Examples of fMCG assessments are shown in Figs. 9 and 10. This promises to be a useful tool in advancing fetal intensive care monitoring. Our data supports that many fetuses with arrhythmias have serious repolarization abnormalities, and the presence of unsuspected life threatening arrhythmias potentially contributing to high fetal demise rates.40, 70 For example, in a very recent report of 28 fetuses with congenital heart block, fMCG studies demonstrated 30% of these fetuses had either junctional or ventricular tachycardia.39 These were unsuspected by echocardiography. The technology shows promise in evaluating fetuses undergoing fetal cardiac surgery and in following the progression of medical effects when drugs are used to treat the mother or the fetus. Fig. 9. FMCG recording from a 24-week GA fetus with complete heart block. Note in the top two tracings that the rate is stable at about 52 beats/minute during 5 minutes. There is no reactivity of the ventricular rate with the fetal movement, denoted by the upward-facing arrows in the actogram tracing. In the lower tracing, the maternal QRS is marked "m", fetal QRS "V", and the fetal P waves with the downward-facing arrows. Note complete atrioventricular dissociation. The QRS duration is not prolonged in this case, but due to the non-reactivity and low rate, this fetus will require pacing after birth. Fig. 10. Three different forms of fetal tachycardia are shown using fMCG. P waves are denoted in the top and bottom tracings with a "p". Note AV dissociation during junctional and ventricular tachycardia, but 1:1 association during SVT. JET and VT are distinguished by the narrow QRS of JET and the wide QRS of VT. Recent advances in echocardiography allow assessment of the kinetic movement of myocardium The cursor can be displayed from various locations from atrium or ventricle giving the timing sequence of cardiac events.76 Other new modalities, such as velocity vector imaging, tissue Doppler imaging, and combined fMCG/Doppler imaging may also add to arrhythmia analysis, but are so new that their importance is difficult to judge at this time. Zhao H, Cuneo BF, Strasburger JF, Huhta JC et al: Electrophysiological characteristics of fetal atrioventricular block. J Am Coll Cardiol. 2008;51(1):77-84. Zhao H, Cuneo BF, Strasburger JF, Huhta JC et al: Electrophysiological characteristics of fetal atrioventricular block. J Am Coll Cardiol. 20081;51(1):77-84.